We also use rhythm to aid the structure of the class. When preschool age kids arrive in group time, their energy can be very scattered, and if we tried to go straight into discussion or reading a story, it would be hard to gather their attention. But clapping rhythms together helps us all get synched up and focused on the same thing. Here are some of the activities we use throughout the year. Hello song with drums. Teacher drums rhythm while singing: “Dum-diddie-dum Can you bang my drum? Banging my drum is lots of fun. Hello ___.” Let that child bang drum. “Hello _____”. Bang. “Hello ______” Bang. “Hello _____.” Bang. “We’re glad you came today.” And continue till all are done. Clap the rhythm of words – one clap per syllable. Do the first and last names of each kid in the class. For little ones, you clap the rhythm once [Bill-y Thomp-son], then everyone copies. For older ones, ask them to clap their own name rhythm first (correct them if needed), then everyone copies. Help them notice if anyone else’s rhythm matches theirs. Foods: Ask them the name of a favorite food. Have them clap them, and draw them as notes on the board. Quarter note = fruit, pear, bread. Two eighth notes = cherries, pickles. Three eighth notes: strawberries, bananas. Four sixteenth notes: watermelon. Clap any words related to the day’s theme. Ti-ti-ta ti-ti-ta. Ti-ti-ti-ti-Ta-Ta. Tika-Ti. Tika-tika-tika-ti-ta-ta. Tiki-tiki-tiki-tika-tika-ta. Tika-tika-tika-ti tiki-ta-ta. Dum-tek, dum-tek. Dum tek-a-tek. Dum-tek-a-tek tek-a Dum Dum tek. Drum to music. Put on music and everyone drums along. When the music stops, they freeze. Pat a cake. https://www.youtube.com/watch?v=yULp0Vnzblc First teach how to clap, left, clap, right, etc. Once they have that, then teach the pat it, roll it motions. THEN put it together with the rhyme. A Sailor went to sea. https://www.youtube.com/watch?v=7NEwPQUFHcc First, teach the pattern: clap-lap-clap-lap-clap. Then add to that hands-hands-hands. Then start saying sea-sea-sea instead of hands. Then add in the full rhyme. A sailor… alternate method. (clap, clap right with partner, clap, clap left with partner, clap both hands three times, and so on.) Here’s a tutorial: youtube.com/watch?v=sr8P2wt7d7Y, and here are kids doing it full speed: www.youtube.com/watch?v=7NEwPQUFHcc. If all your students were 6 or 7, you could probably just teach this as it is. For younger children: First, two adults demo it. Then pair up one grown-up with each kid. Level one – the child puts their hands up in front of them palms out and just holds them there. The adult claps against their upheld hands. If they master that, then on to level two – the adult holds their hands still and the kid claps against them. 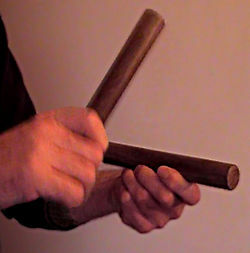 Then for those who can – on to level three, where both clap simultaneously. Level 4 – speed that up! Miss Mary Mack. https://www.youtube.com/watch?v=hP9V0S51GVo Clap-lap-clap. Then right-left right. Then put those together. Then add rhyme. Mary had a lamb. Every time you say “little lamb” they tap their rhythm sticks. This is the way we tap our sticks, tap our sticks, tap our sticks, This is the way we tap our sticks, so early in the morning. This is the way we scrape our sticks… tap the floor… tap our shoes, and so on. Tap your sticks. Tap your sticks. One, two, three. One, two, three. Can you tap your sticks, Can your tap your sticks, Just like me, Just like me? Tap your sticks, Tap your sticks, Way up high, Way up high. No-w, bend down, No-w, bend down, Tap the ground. Tap the ground. Metronome ball toss. Start it slow, tossing ball around the group in rhythm, then speed it up. Or pick out 4-4 music and they throw to that, then waltz music or march music. Rhythmic sound charades: Make cards that have pictures of items that make rhythmic sounds – clock, windshield wipers, washing machine. Have kids draw a card, then act out that object. Move to the tempo. During movement games, tap out a slow rhythm – they move slowly. Tap a fast rhythm, then move fast.